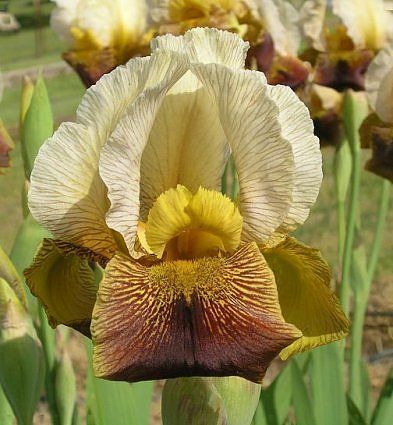 'Rare Breed' (Richard Tasco, R. 2011) Seedling 03-AB-02-51. AB (OGB), 33" (84 cm), Midseason late bloom. Standards parchment tan (RHS 159A) veined darker, chrome yellow (15C) at base of midribs; style arms chrome yellow, slight red band along ridges, large crests lightly veined red on front; Falls red orange, lighter toward edge, chrome yellow veins around beard, slight chrome yellow edge veined red, small oxblood-red (183 A) signal at end of beard; beards golden brown, 1" wide and thick. 'Sheik' X 'Bagdad's Folly'. Superstition 2011.